Ten-Year Veteran	 Compared to Buicks earlier in the decade, the new Enclave has simpler controls (except the shifter). Ten-Year Veteran	 A 310-horsepower V6 is all 99.9% of large crossover owners will ever need. Quick and decent mpg. Ten-Year Veteran	 Large compartment beneath the rear floor. Cover doesn't easily come off but can be folded upward. Ten-Year Veteran	 As much cargo space as you can get in a crossover (except slightly roomier because squarer Chevy). Ten-Year Veteran	 So much cargo space with the third row folded that it won't often be necessary to fold the second. Ten-Year Veteran	 Much more space behind third row than in most large crossovers. Plus another 9 inches below floor. Ten-Year Veteran	 Much roomier than the Volvo's third row. Still not roomy. Ten-Year Veteran	 The second-generation has roomier and much more comfortably positioned second-row seats. Ten-Year Veteran	 Not a bad seat, but to be accepted as a true premium vehicle the Enclave might need more here. 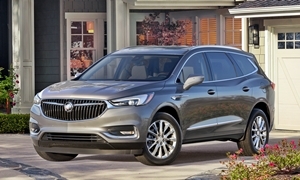 Ten-Year Veteran	 Compared to Buicks earlier in the decade, the new Enclave has much simpler controls. Clean. Ten-Year Veteran	 Low flowing instrument panel. Ten-Year Veteran	 It's not so much that the Buick's interior falls short as that the Volvo's surprises. Ten-Year Veteran	 This saddle color is only offered on the Avenir. Sporty console with clunky shifter. Ten-Year Veteran	 Artful "sweep spears" high on the fenders are a classic Buick cue that work well here. Ten-Year Veteran	 "Floating roof" treatment at the top of the rearmost pillar. Rear end more square than it appears. Ten-Year Veteran	 A brick has rarely appeared more handsome. Ten-Year Veteran	 Many beautifully flowing lines on this car. Somehow they all seem to fit, none seems extraneous. Ten-Year Veteran	 Complex yet elegant grille. The wings--two sets of them--are neat details. Ten-Year Veteran	 Large but not disproportionate grille. Artful flowing lines.